I have been really hungry for soup lately but it has been so darn hot outside that I don’t really want to make something hot to eat. 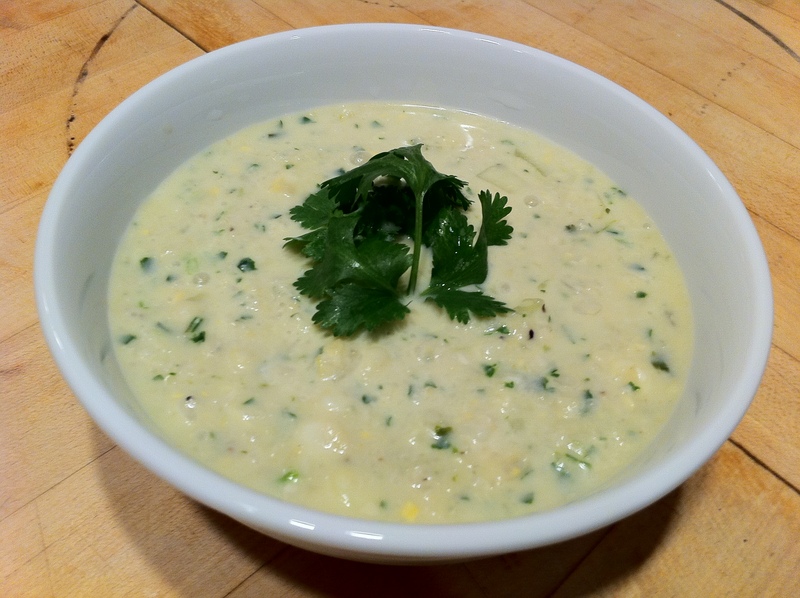 I came up with this cold soup that is actually inspired by a soup that I made up last year when I had a ton of extra corn. I’ll share both recipes with you and you can try them both! Before we start, I would like to share a handy tip: Place the corn on a baking tray or a large round dish on top of an inverted bowl. You will catch all of the kernels and they wont go flying all over the counter top. I usually cover the inverted bowl with a damp paper towel, just in case I hit it with the knife. You don’t need the bowl if your tray or dish has low sides. *not the best picture, but you get the idea. Bring the 3 cups of stock to a boil. 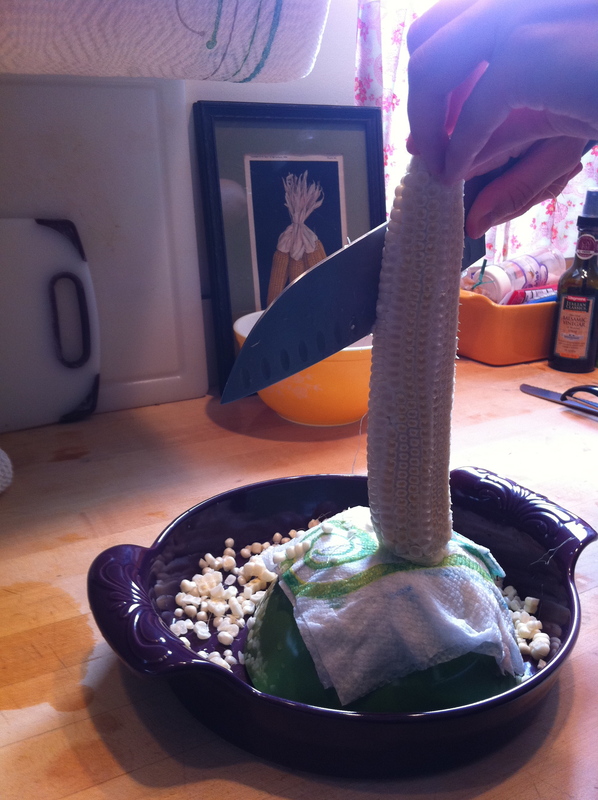 Remove the kernels from the corn and place them into the boiling stock. Turn the heat down to medium so your soup is at a simmer and add the garlic, butter, salt and pepper (about 1/2 tsp of each). Let the soup simmer for about 10 minutes. Meanwhile, peel and seed the cucumbers. 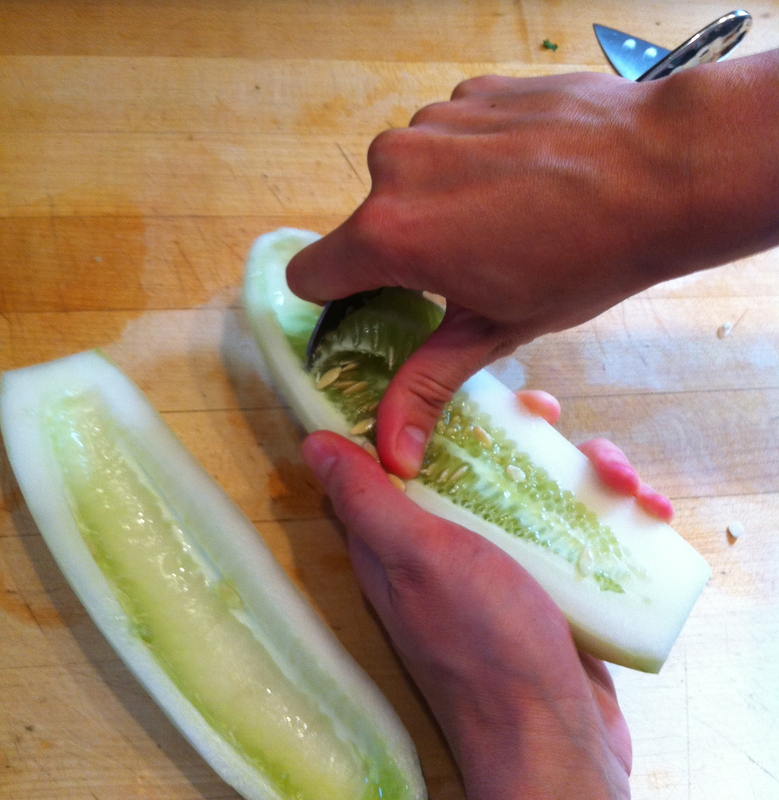 To remove the seeds, cut the cucumber down the middle and run a spoon down the center of the cucumber, it will dig out all of the seeds. 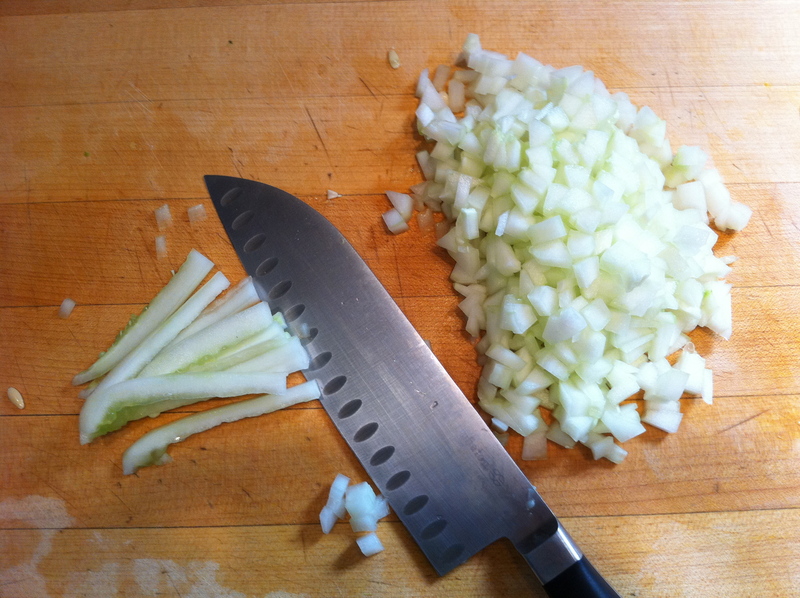 Cut one cucumber into small cubes and set aside. Take the other cucumber, cut it into chunks and put it in the food processor (you could also use a blender but you might have to work in batches). 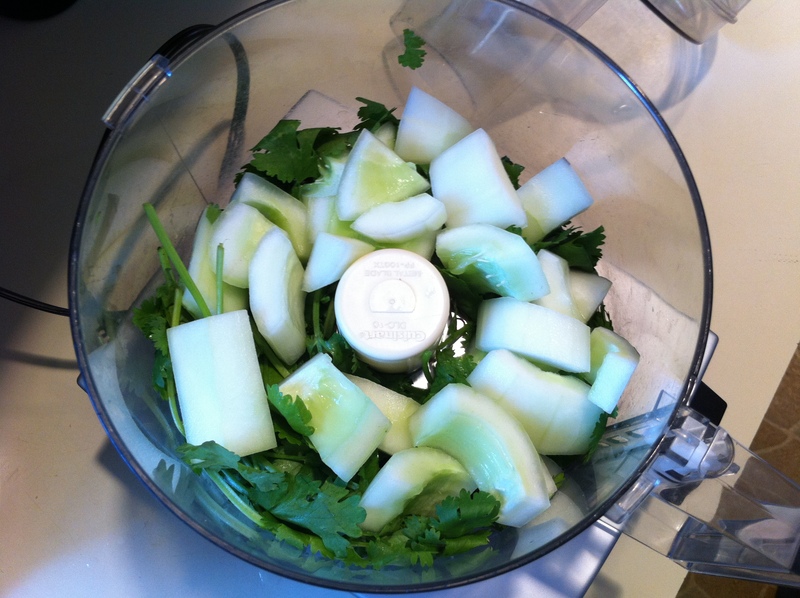 Add the cilantro to the food processor with the cucumber. Ladle out about half of the corn kernels and liquid from the soup pot into the food processor. Pulse the mixture until no cucumber chunks remain. Pour the cucumber-corn mix back into the soup pot with the rest of the corn and stock. 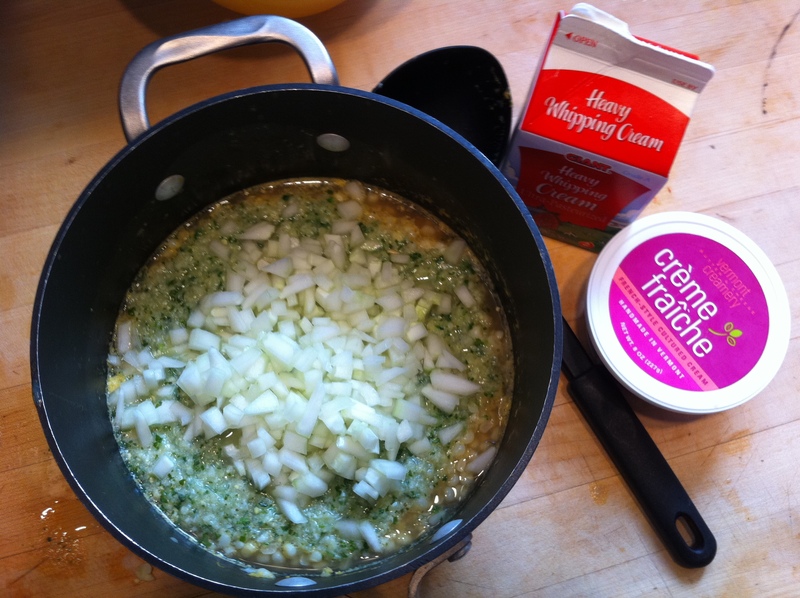 Add the small cubes of cucumber, heavy cream and creme fraiche. Season with salt and pepper to your liking. Place it in the refrigerator to cool down. This is a great dish to make ahead of time. You could eat it warm or at room temperature, but it is really refreshing cold, especially on a hot day. 4-5 medium sized ears of corn, kernels removed. Heat the olive oil in a soup pot and saute the garlic, jalapeno and corn kernels over medium-high heat for a few minutes. Sprinkle with salt and watch as you are sauteing, you are not trying to caramelize the onions, just saute until they are soft. Add the stock and bring the soup to a boil. Turn down the heat to medium and let it simmer for about 10 minutes. Blend the soup with a hand blender until smooth. You’ll have to ladle the soup into a blender and work in batches if you do not have a hand blender. Mix in the creme fraiche, cilantro, and butter. Season with salt and pepper to taste. If you want to add a little smoky surprise or a little extra kick- you can add 1 tsp of smoked sweet paprika. For a thinner soup, add more chicken stock. I usually eat this one hot, but it is probably good cold as well.